I'm not sure what prompted this Mexican Pot Roast. Although I like Mexican food very much, I don’t make it very often, but as I was trying to decide how to cook a chuck roast I'd bought this recipe leapt to mind. And on my mind's tastebuds, it tasted absolutely delicious. So of course, I had to make it. I also decided to incorporate a couple of licks from other Mexican/Southwestern dishes and shredded the beef before serving it on corn tortillas. 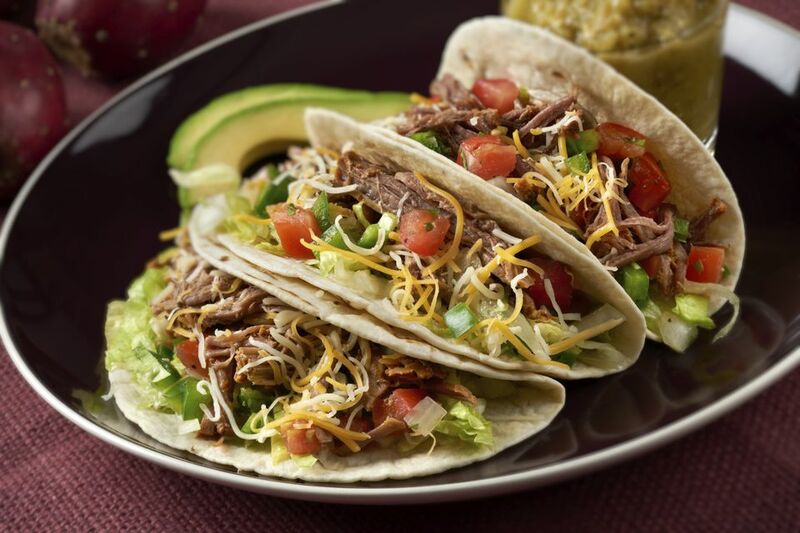 This shredded beef could also make a tasty Mexican Salad. If you want to see some other recipes for braises, check out "In Braise of Cheap Meat". 2. Season the roast* with salt and pepper. 3. Heat oil in a small dutch oven (compare prices) or a cast iron skillet over medium-high heat and brown roast on all sides. Remove roast from pan once browned and set aside. 4. Reduce heat to medium and sauté onions and peppers until translucent. Add garlic and cook 1 minute longer. 5. Increase heat to medium-high, add beef broth and deglaze pan by scraping up browned bits. 6. Stir in tomato sauce and then stir in remaining ingredients. Bring to a vigorous simmer. 7. Cover pot and place in the center of oven. Cook 1 hour, taste sauce and adjust seasonings. Turn the roast over, and cook 1 hour longer. Turn and cook 1/2 hour more. 8. Remove roast and shred using a pair of forks, discarding any fat. Combine with sauce. 9. Serve topped with sour cream and salsa with corn or flour tortillas as scoops. *Note 1: For this recipe, you want a thick piece of meat so that it cooks slowly, I bought a 2-inch thick 2 3/4 pound chuck roast, then I cut it in half and froze half for later use. **Note 2: You can certainly use a commercial chile powder, but I prefer to make my own using this recipe.